Farnoosh is also an accomplished author with many bestselling books under her name. In fact, she is releasing a book today and I’m happy to be giving away 3 copies of her brand new book “When She Makes More: 10 Rules for Breadwinning Women”. All you have to do is sign up for my podcast contest and you’ll automatically be entered. To learn more about Farnoosh, you can find more info at Farnoosh.tv. Note: Farnoosh and MyWifeQuitHerJob.com are not affiliated in any way. I used my own money to buy the books for the giveaway. Enjoy the interview! How Farnoosh laid the ground work for her own personal brand before she got laid off. The one thing Farnoosh did to land her first book deal. Steve: You are listening to the mywifequitherjob.com podcast episode number 10. Now before we begin I just want you to know that my podcast give away is ending this week, so make sure you sign up soon. Now, I’m giving away a free lifetime membership to my create a profitable online store course as well as free consulting. Now, my course is the most comprehensive course out there on ecommerce that teaches you how to make money with online stores and unlike other courses I give live lectures and I’m constantly adding new content to the class. For more information about the giveaway go to www.mywifequitherjob.com/podcast-launch. And while you are there be sure to sign up for my free newsletter, where I’ll teach you how I managed to made over a 100k in a single year with my own online store. Now on to the show. Steve: Welcome to the mywifequitherjob podcast. Today I have a different type of interview for you all. Unlike the other people that I’ve had on the show this particular guest does not own her business in the traditional sense. Instead she owns something much, much more valuable. Unlike a regular business which can go out of business at anytime Farnoosh Torabi of Farnoosh.TV has developed something far more valuable, her own personal brand. And in a way that’s what I have been trying to do with my blog and my podcast but Farnoosh has taken this to a whole another level. 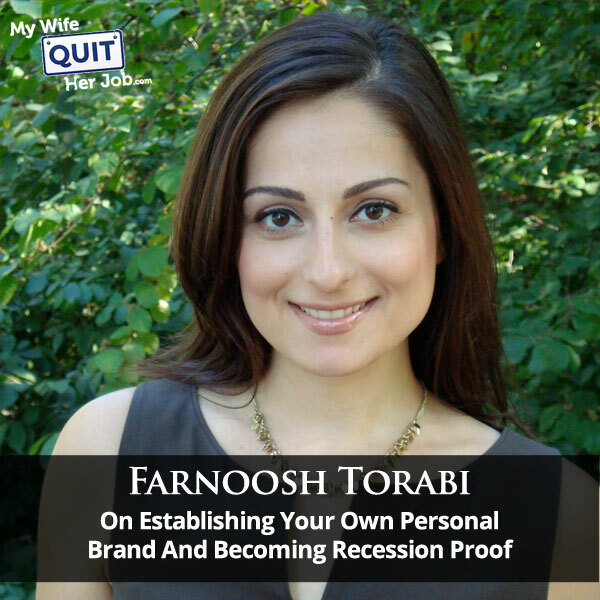 Now, Farnoosh Torabi is a personal finance expert, author, speaker and coach. She’s a frequent financial contributor to Yahoo. She’s been on the Today Show, ABC; she’s written many books includingher latest book which is ‘When She Makes More: 10 Rules for Breadwinning Women’, which we will talk about a little bit later. She’s also written ‘Psych yourself Rich: Get the Mindset and Discipline You Need to rebuild your Financial Life’ and ‘You’re So Money’. Now I’ve even seen her on TV with Jim Cramer of nerd money which pretty cool also. She has hosted her own web series which turn into the number one personal finance series online. She’s been on Remake America, TLC, she’s been on CBS, MSNBC, CNN, Fox, I mean could go on and that could actually probably take the entire interview and I actually want to talk to her today. So, you know, word on the street is that Farnoosh owns what is called the Noosh Empire, so welcome to show Farnoosh glad to have you here. Farnoosh: Thank you so much Steve that is such an awesome introduction. The Noosh Empire I’m going to take that, I’m going to borrow that for sure. Steve: You don’t have borrow it. It is already out there. Farnoosh: I own it. Okay. Steve: Yes for all those who do not know who you are, can you give us a quick background story, because you have a very interesting back story. Farnoosh: Well, thanks I hope it’s interesting to your listeners, I mean, I started out, I went to college, I went to graduate school. I studied finance in college, and then I went and studied journalism in graduate school and I combined the two fields to then pursue personal finance, reporting and writing and all of that. Though I found quickly and this was I think my lucky break earlier on, is that I realized that if you want to be a journalist, if you want to be a communicator you don’t have to pigeon hole yourself, you don’t have to be just a writer or just a radio host or just a broadcaster you can do it all. And to implement a sense of entrepreneurship in your career, that is something I learned very early on in my career. Steve: So let us take it back to the very beginning, particularly I’m interested in hearing you know how this all started. I’m interested in hearing about how you got laid off and that story, but how you got started with a need to establish your own personal brand. Farnoosh: Sure, so I was working at TheStreet.com and for several years I was helping them with their online strategy, with their video strategy we were having a great time. But you know 2009 rolled around and of course everything was crashing, the sky was falling, the economy was on life support and what we found was people were just losing their jobs left and right. Companies were reducing, reducing, reducing and so, I was also part of that reduction. I lost my job in 2009 and I have to say though it came at a really important time in my career. Up until that point I had been you know working sort of this full time job at The Street but I was also, I published a book, I was freelance writing elsewhere, I was doing TV and I started to see you know that there were a lot of opportunities out there and that there were other people who were completely freelance doing those things. And you know well, I wanted kind of the best of both worlds. I wanted the 401k that the job would give me, a full time job but I also wanted to experiment and dip my toes in other adventures and I had been doing that pretty well up until that point, and then you got point laid off. And now the question for me became, do I go back to find another full time job to provide me those securities that I thought were really important like 401k and health care, constant pay cheque, or do I just sort of incorporate myself and try to build the momentum that I had build in these other side projects that I had been doing. And you know 2009 the job market was pretty slum and it wasn’t like I had all these choices. So I just decided and fortunately at that point too, I had some savings, right. That’s really important if you’re ever considering taking a leap into a risky business, or going on your own, venturing out on your own. Having the financial cushion was a peace of mind, and it also allowed me to explore things that I probably wouldn’t have, and to take time to really find my groove again and it wasn’t this knee jerk reaction that I had to find a paying job again right away. So, I thank myself I guess for that. I mean who can ever anticipate getting laid off? But fortunately I had some savings, so I dint have to feel pressure to just take whatever came my way. Steve: So, it sounds like you had already kind of laid the ground work even before you got laid off. It sounded like you had your book before that happened is that correct? Farnoosh: Yes, I had my book it came out in 2008 got laid off in 2009, and I guess I just, you know I was doing all these things because I was passionate about them as so many of us do we do these side gigs as sort of passion place. But truly if we want to be strategic about it, it could end up being our next kind of endeavor. Our next full time entrepreneurial endeavor if we really wanted them to be and I think for me what was holding me back was, I was comfortable frankly you know working full time gig. Getting that constant pay cheque and doubling in sort of extra curriculars like the book and what not. And also I was a little scared frankly of what if I truly leave my job voluntarily and do this other stuff full time, and you know what would that look like, and would I be able to feed myself, and fortunately the decision was made for me getting laid off. I have written about this experience and looking back, obviously at the time you don’t feel this way but looking back was certainly all right this is a decision that I had no control over I couldn’t beg for my job back. Even if they you know really felt bad for me, but it worked out. Steve: Yeah, so let’s take a step back and let’s talk about that first book, so had you been on TV at the time too before your book? Steve: We will be sure to post that. Farnoosh: Okay, great. I’m sure you can find it on YouTube. It was like my very first interview. I was on the Today Show, I am– we are talking about my book and I think Meredith Viera was interviewing me and I think I called her old. And it was just, I mean everything that I– it was like my worst nightmare come true. But actually I finished the interview and when it was over my producer said “good job we will have you back” and I was like “really? Were you there, did you just watch what happened?” I think in our heads things go a little bit more horribly than they actually do on camera. The key I found was just to continue smiling and hopefully that would defuse any of the like awkward energy that I was sending out from my conversation. But I don’t know, someone was looking out for me that day and it didn’t totally destroy my future career in television, but it definitely felt like a horrible experience in my head. Steve: Sure, so I’m sure at least one of the questions I have in my mind is that, you know how do you actually find someone who is going to publish her first book and how do you actually get that opportunity to be on TV in the first place? Farnoosh: Okay, really good questions. I’d say writing a book, now you can self publish and back then when I wrote my first book it was not something that was considered easy to do or successful to write your own book and who was going to publish it, you really needed like a traditional publisher in order to get the street credit that you wanted to get the interview. So I think that, you know these days publishers wanted to care about a couple of things. They care about, they care about obviously that you have a really, really enticing, compelling, interesting story to share whether it’s fiction or nonfiction, but also they want to know why you as the author? Why should you be the person who tells the story and especially with nonfiction obviously, you know what makes you the expert, what makes you the guru, what makes you, someone who is going then to be able to bring this story to market and sell it, right. So it is not like just you know, Farnoosh has a really cool perspective on money, it’s that oh she also has relationships with people in the media or she has a blog and it gets x many millions of hits a year. Or she has this podcast that gets lots of downloads. They want to make sure that you are marketable. And that you can help them market the book because, and this is again going the traditional book publishing route because publishing houses are overwhelmed, understaffed. They really rely more and more these days on their authors to support the marketing and the promotion. So it’s not, I would say it is 50% of your proposal is how you are going to sell this book successfully, you know. If you give speeches, if you go to conferences, if you have relationships with co-operations that might get bulk book buys, if you’ve got a huge online audience that’s conditioned by your goods, that is all important to mention because that’s ultimately what’s going to give you a good advance and really get you the book deal. And that’s so unfortunately I think what separates some other authors from getting published and others not, there are a lot of great authors out there with great stories. But if no one knows who you are, and you are kind of hiding in a hole, it’s very hard to just rely on word of mouth, these days to get a book sold. You really need to get out there and make efforts well in advance of the book coming out to get people aware and excited about your book. Steve: So let’s talk about your first book then, so had you already had an established audience for yourself? Farnoosh: Somewhat, I think, you know, certainly when I was pitching the book, the publishers were excited about the fact that I worked in the media that was a plus, they considered a plus. I think they were hoping that my savvy in the industry would get me you know would the book in the right hands. I knew producers, I knew writers, and when I sold the book ultimately I had just moved over to The Street.com, where Jim Cramer had generously offered to write the foreword to help endorse it so that was a huge, huge help. I don’t think I could have gotten the book published in the manner that I did if it wasn’t for his vote of confidence and he really wrote letters to the publishers and they were like you know, we’ll help her market this in and I mean credit yeah Jim was really super instrumental in helping me launch my career, in a lot of ways and with that book. And the book later took on like a life of its own and it has since you know helped me with other things, but I owe him big time. So that was for me and that was something that my agent recommended, he said “you know you’ve started this company, have you met Jim Cramer yet?” I said “no I just started like two weeks ago, I know my editors, and you know Jim is the founder, but he is a busy guy I have not run in to him in the office”. So I actually made the request through my editor in chief to see if Jim would read the proposal and tell me what he thinks and he if he would be willing to do something, maybe a foreword or a chapter. And he took time you know I was like oh gosh he hated it, it was taking weeks before I heard back and I remember it was around thanks giving, I got a– my editor was like he read it, he loved it, he said he will do whatever you want him to do for the book. Steve: Wow that was awesome. Steve: That’s actually a great lesson, you got to ask the question otherwise you may never know whether you are going to get results or not. Farnoosh:Yeah absolutely, taking the fear it’s just you know it can hold you back but sometimes I always say like the fear of the unknown is worse than just the fear of failing. You know like I’d rather just fail and have an answer than to never try and feel like I just you know I’m just stuck. Steve: You know in a way this is just like me starting my podcast. I’ve asked actually asked a few bigger names and I have gotten denied, and you know I plan on asking them again once the podcast gets a little big larger. So let’s talk about TV, how did you get your first TV segment on the Today Show? Farnoosh: Well that was thanks to the publisher, you know I just spent all this time talking how my publishers really depend on their writers, but I will say that even though they booked that for me, what ultimately got me their attention at the Today Show because you know Today Show gets a ton of book requests, author requests, interview requests. Every day they get like sacks and sacks and sacks of books. Well when I was 20 years old 21 years old I had an internship at Money Magazine and as part of that job I worked in conjunction with the Today Show because Money and Today had kind of editorial partnership. So I was in constant communication with this one producer of Today Show and helping her with our content and our guests that were coming over to talk about Money and I remember we would talk– I mean I would work all nights sometimes for these assignments and she remembered me and we had met. And so fast forward you know seven years and my book lands on her desk, this producer of The Today Show. And she recognized my name, and she recognized me and called me and said “did you write this book I can’t believe it, it’s been so long you have come so far. I can’t believe it”. Now, so that was definitely helpful because had I been a really a crappy intern when I was back at Money, she would remember me as this like unreliable, you know silly person who you know, oh she wrote a book but I don’t have good memory of her so you know so well good luck to her. But she actually, you know was excited to hear that I’d written this book, and had good memories of working with me. So that helped move the needle but it wasn’t a guarantee, I wasn’t going to get on the show just because she liked me. You know she needed to prove to her bosses that I was ready for TV. So she asked me for any kind of tape that I had that I could produce that showed me on camera looking comfortable and relaxed and articulating. So I just scrambled and put together whatever I could you know from my days as a reporter. The one CNN hit that I did when I was 22 at Money Magazine and sent that to her, and I got the call that they wanted me on the date that, that book launches. I think I just– I think I fell back in my chair when I got that email because on the one hand I was so excited, I mean you really like you know there’re moments in your life you feel like this is my break. Farnoosh: But you are also scared to death. And I had all these feelings at the same time. Steve:	So, there are some good lessons to be taken from what you just said. So one thing is you know should always do your best and never burn any bridges because you never know when someone you meet might be able to you know help you later on in life. Farnoosh: Absolutely. I can speak from that; I can speak to that in so many ways, but that was probably the biggest example you know when you are, especially young kids today when they are out there working, internships, or in college you know there is so much more life ahead of you but the relationships that you establish, or even just people you interact with casually sometimes can be the people that will help you go from point A to point B in the future, and you should be prepared to do that for others as well. Steve: Yeah, you know I know that I’m going to do my best to help you promote your book after this. No strings attached or anything you know after chatting with you a little bit I already like you and I very much respect you, and so I’m going to do whatever I can to help you out. Farnoosh: Oh my gosh. Thank you so much and of course I want to help you out too. So let me know how I can ever return this huge favor. Steve: So we have these listeners out there, you know a lot of them are just starting out, and so if you have any pieces of advice for people who want to follow your same path. You know what advice would you give them? Farnoosh: Well, if you are interested in writing a book and I don’t know if up your audience wants to primarily do financial books or other books. I would say and I was just giving this advice to another hopefully future author, we had coffee the other day, she was struggling over her book proposal. My advice would be to obviously you know every book has it’s facts and it is important to make the book educational, or service driven if it is in the nonfiction world, but at the same time again it is about your voice right, why you? Why are you bringing this book to attention and why are you best the person to share this story. And so, going to a pretty vulnerable place sometimes it is important to unearth some of the stories that in your life really influenced you that might relate to this topic that you are writing about. Readers really appreciate authors that are transparent, that are open, that show vulnerability, because people, I find out that, that is not something that you will often hear because people think like well you are the author you should be the expert, you should just be the authority and you know, not show that that you have weaknesses like. I totally disagree, I mean even with my new book you know I am helping women with their partners in the event that she makes more, and I’m in this situation and I’ll be first to say it has not been easy for me. And you know I’ve gotten mixed advice in the process of people saying you know may be you shouldn’t like say that you have this insecurity because you know if you are supposed to tell people what to do, you are supposed to be the strong one and I disagree with that. I think you know certainly, we all have insecurities and I think I’m not a complete mess; I am not coming to market with this book like completely distraught. I have moved on, but it’s just that I think sharing that you are human, sharing that you have a connection with that audience is so important. So don’t lose that perspective and really cultivate that if you can in your book writing process. Steve:	That’s good advice, yeah. So for people just starting out from what I’ve gathered from what you said so far, it almost sounds like you need a following first before you even consider writing a book, is that accurate or? Farnoosh: Yeah, but it doesn’t have to be huge following. You might have just a 1000 people on your blog and I know that sounds even– I just started the whole online process of getting people to join newsletters and stuff. So, I’m completely damp founded when people say like they have like 500,000 subscribers. It’s like I’ll never get there, I just have my you know, I’m starting at a much smaller number but, I think it is quality not quantity right. You could have half a million people coming to your site but how many of them are really engaged. So, but if you’ve got a really good core audience that you know is commenting and replying. You can tell by their engagement that they are really quality followers and readers, that goes a long way and that is something you want to present your book proposal. If you’ve got a really active twitter handle, if you are on face book, if you are giving speeches, it doesn’t– you don’t have to be a traditional correspondent to get a book deal, you know that’s not what we are talking about. We are just saying that you have a loyal and dedicated audience and that you are engaged with that audience, then that could hopefully get you the attention of publishers. But even if not, you want to go the publishing route, you could to go the self publishing route. I don’t know a whole lot about that, but certainly people are doing it successfully. I just actually spoke to a woman who in her spare time she writes romance novels, really short romance novels, but did you know romance novels are one of the hottest book categories. I mean like no pun intended but like these books go really well. Steve:	You don’t have to tell me that, my wife reads them all the time. Farnoosh: Right? Like I know, I don’t know, I was totally schooled in this. And she’s like yeah so, I write; I’ve written a couple of books, I sell them for like 299 on Amazon and you know she makes a few thousand bucks. Every time she writes these books and they sell really well. And it is a complete side project, it takes her like you know a few months to put them together, she loves to write, it’s like her passion. So, I say you know that is another way to be a successful author. And she could be because she’s identified a niche market that people are always wanting to read you know the next great book and she prices it really low, and it comes easy to her, it’s not like she has to hire people to do this. And you know to the return is quite good for her. And who knows what it will all turn in to, may be like somebody will read her book and will be like I should turn this in to a movie. Steve: Yeah, that’s how it happens right? Steve: So you mentioned that, you said your online presence is really small and which I find hard to believe, but who are the people actually buying your books in bulk right now? Farnoosh: People who are reading the reviews right now that are going on as we speak you know between now and May 1st when the book comes out. There is already a tonnage of articles out there– not a tone some articles out there. But I’ve also been contacting people who have bigger online audiences than I do and saying “hey I’ve got this book coming out, how can we partner up, let’s get on the phone, and I’d like to help your business, you know if you will be willing to review my book or” what I’ve done is I created a promotional kit. I mean I’m going to do actually, I think probably when I go to Thinkon this Fall, I might actually give everyone the play by play of this latest book launch, because I have learned so much about the importance of online marketing, and for me in a while I work online I don’t have this like huge newsletter database. It’s just not something that I have focused on but it is the new kind of direction for me. But, there are people who have been online for 10 years and they’ve got so many polarizing and really loyal fans. So, I find these people and through hopefully introduction or referral introduce them to the book, give them all the goods, give them the book, I give them you know images, I give them potential blog posts already written, I give them copies for newsletters and emails that they might want to sent out. I give them badges and all these stuff and so they kind of I arm them with everything. But then still I say you know, if there is anything else that I can provide you that would be a better fit for your audience maybe it’s a podcast interview, maybe it’s a Skype interview, or it’s I interview you and you give that to your audience. Steve: I have to say you have handled this book launch very thoroughly and in a very organized fashion, I was very impressed by that. Steve: So let’s talk about your latest book now. It’s called ‘When She Makes More’ and it is a guide book targeting women that earn more in their relationships than their husbands. Now, technically the business that my wife and I started together you know makes more than I do, perhaps this is a plus to her but personally when I was younger, I often dreamed of meeting that sugar mama like yourself Farnoosh. Steve: So what’s the back story behind the book? Farnoosh: The back story is that we know women are outstanding in the workforce, we know that women are making more in their relationships. I think we have seen the headlines by now. There have been some great books actually written about this trend, but as somebody who is living this reality, and as someone who works in the financial space, who see other relationships, struggle with money and particularly with this kind of new normal dynamic of she making more. I felt like we were not having the conversation of really how to make these relationships thrive. Certainly there are couples out there that do it effortlessly. We need to laugh, I know that was not easy to come. Steve: That was very effortless. Farnoosh: Yeah. When you look at the statistics Steve, you know. If you look at the divorce rates, if you look at the infidelity risks women who make more have a 50% higher chance of experiencing divorce, a higher chance of infidelity in their relationship. If she’s single and does well financially, she is less likely to get married. And she does more house work when she’s married and makes more. I mean there is all this, all these difficulties, all these complexities that are specific to women who are bread winners. Steve: I would imagine that your target audience, a lot of them must be female entrepreneurs, right? Farnoosh: Many are certainly, and I find that actually with female entrepreneurs who are running their households financially at some point the conversation in that relationship does turn to, may be my husband should join me in my business because it is the only we shall see each other. Farnoosh: And it’s one way to for them to kind of you know, it doesn’t work for everybody, but then I have interviewed a lot of female business owners who whether business has really taken off and in order for them to really maintain a relationship of intimacy but also like to have their schedule sync up is to have him kind of participate in the business somehow. Steve: So here is an interesting fact and I’ve never revealed this to anyone thus far, but I run this class where I teach people how to start their own businesses and I usually wouldn’t announce this publically, but there has actually been a couple of divorces among the students, and I don’t know if it has anything to do with the business itself, but I would imagine that running a business since I run a business with my wife, we’ve actually had many fights. We never fight, but we have had fights over the business because we run it together. You know it’s just interesting that there is this other dynamic that you are talking about in your book can lead to a lot of conflict in a marriage as well, so? . Farnoosh: It can I mean money, oh look I would like you to read the book and I don’t want to like you know bore your listeners ears to death with this. Steve: Cool, I will definitely pick up the book when it comes out. Steve: So we’ve talked about a lot of different things, you know I usually like to let my interviews just kind of wander and go on different directions, but I think we’ve picked up a lot of good lessons today. From one thing, I think the most important lesson that I’ve learnt is that, while you are working you should be in the same process kind of establishing your own brand. And in my opinion for you Farnoosh, you’ve established such a large brand at this point that you are essentially recession proof. Let’s say you decide to go back in the work force, it doesn’t matter if anything, if you get laid off or whatever because you will be able to find other opportunities because of the name that you have established for yourself. Farnoosh: Well thanks, I mean and I think that’s the goal for everybody right is to how to make yourself recession proof. No job is a guarantee, but if you have skills and other revenue generating projects from the side to fall back on, you are far more, you are going to be far more financially stable, far more confident too in yourself, in your abilities to get back out there and find something great. And so I encourage everybody to do that you know whether even if you are just selling craps on Etsy, you know not even think junks, I know that’s not an easy thing to do but you know something that is of minimal time but do it, you know because first Etsy could be a really fun outlet for you, but who knows what it could turn into. Steve: So, just curious and you don’t necessarily have to answer this question, you are not working for anyone else at the moment is that correct? Farnoosh: Oh well, I have clients; I mean I have I work with– I write for Money Magazine, I write for other online publications. For 3 years I was working with Yahoo doing videos as you mentioned in your intro, so I, you know I am in self, I am self incorporated, I do have these partnerships right, with other entities to bring financial advice to them and to their audiences. Farnoosh: So that’s how I run my business. I am sort of this, I guess financial media production company. Farnoosh: And whether your company needs a webinar, or a speech, or a video, or an article, I can provide that. Steve: Okay. Great so if there is anyone out there who wants to get in contact with you, how can they find you? Farnoosh: They can go to my website which is farnoosh.TV and you can learn about what I do, all the different work that I do with partnerships, and if you want to contact me directly email Farnoosh@farnoosh.tv. The new book is called ‘When She Makes More: 10 Rules for Bread Winning Women’. That site is when she makesmore.com and so we’re running a really fun promotion between now and the launch day on May 1st where if you order the book, pre-order the book, you will earn bunch of freebies and there are some really bonus prizes that we are giving out, a limited number but you could win. You know gift pads to taskscribeit, and Evernote and you could come to the Today Show with me, so there’s lots of fun stuff. So I encourage people to explore that site and see if they are interested to buy a book, and hopefully if you have any question about it, I just gave how you can reach me so hoping to hear from people. Steve: Yeah, I will go ahead and link up actually all of your books and the show notes but I’ll particularly highlight that promotion that you’re doing for your latest book. Farnoosh: Thank you, thank you so much. Steve: So thanks a lot for taking the time to be on the podcast. It was a pleasure. Farnoosh: I had so much fun Steve, thank you and hoping, wishing you continued success with your podcast you know it’s been extremely popular and hopefully greater things to come for you as well. Steve: All right thanks a lot Farnoosh. Steve: Isn’t Farnoosh cool? Now she’s established herself as an authority within a niche and as a result she gets television appearances on the Today Show very regularly. And she had the fore sight to pursue her passion and go launch a book before she got laid off, so she had a foundation to go out on her own. Now I’ve no doubt that her brand new book will do well. And speaking of which, I am going to be giving away three copies of her book to three lucky listeners who signed up for my podcast contest. So, not only do you get a chance to win a lifetime membership to my course and free consulting, but you could also win her book as well. For more information go to mywifequitherjob.com/podcast-launch. Thanks for listening. Thanks for listening to the mywifequitherjob podcast, where we are giving the courage people need to start their own online business. For more information visit Steve’s blog at www. mywifequitherjob.com. Very interesting. I’m a self published writer myself and I have written 3 books in the Kindle store. I did not know that Romance was one of the biggest sellers. Thanks for the interview and best of luck to Farnoosh.